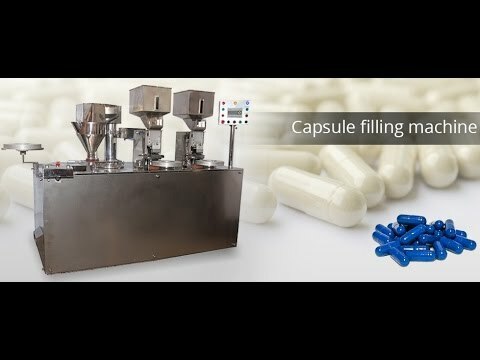 Semi automatic capsule filling machines are widely used in developed companies where the requirement of production of capsules to be filled is around 1 lakh or more quantity per day. We provide a complete cGMP model high Degree of automation with higher levels of filling weight accuracy. There are two models available bifurcated based on the speed required which ranges from 20,000 capsules per hour to 30,000 capsules per hour. One is single loader model and another is double loader model. Speed and efficiency in double loader model are bit higher compared to single loader model. In these models, the loading of capsules, powder filling of capsules and locking of capsules are automatic. The operator just needs to operate the position of loading trays from one station to another. We can offer any customization in semi automatic capsule filling machine as per the suitability and requirement of the customers. This semi automatic capsule filling machine is in great demand and so designed and constructed by qualified engineers with good all SS tested material as per pharma standards which deliver the product with best quality output and least breakdowns. Luthra make pneumatic cylinders provided. Fill Accuracy ± 1 %. 2 no's loading plate in aluminium provided. No of holes in the capsule loading tray depends on the capsule size. FRL provided with the machine. Suitable capacity SS 316 Auger Filler for filling of powder into capsules. Machine Body will be in MS Painted covered with SS304 Sheets. All contact parts will be in SS 316 or Aluminium. Delta make Variable Speed drives and Delta make controller provided. Vacuum pump for separation of capsules provided. SS castor wheels (Super Quality) at the base. 4 no's adjustable bolts provided. The humidity and temperature of the filling room, where the machine is located is very important to ensure the proper flow of the capsules. Failure to control the humidity can result in the malfunctioning of the orientation system leading to capsule jamming. The normal humidity range for the operating condition is from 40 – 45 %. 20,000 – 22,000 capsule /hour. 200 litres/minute at 100 p.s.i with 8 cfm flowrate. 440 V,3 phase, 50 Cycles. Note: Power supply to the machine to be with a neutral connection. The absence of neutral connection is harmful to the electrical components. 500mm (20") of Hg. at 1000 Ltrs./min, 1 No., 30 cfm. I would like to enquire about KI-SCF Semi automatic Capsule Filling Machine .